The new tin roofs of the Salmetar Primary School, Dhading, gleam in the late afternoon sun. Supporting the roofs are robust metal rafters, which sit atop the classrooms' brick walls, whose pillars have been fortified with rebar. The long, narrow buildings of todayís Salmetar Primary School stand, as it were, in stark contrast to the rubble that was left behind here by the 2015 earthquakes. The school students have Chhiring Ongdhi Sherpa and his organisation, Village Nepal, to thank for the new school infrastructure. In the days after the first earthquake struck, Sherpa was shocked by the havoc it had wreaked in his neighbourhood of Jorpati, Kathmandu. He saw scores of buildingsóeven concrete ones--damaged almost beyond repair. And when he heard that things were far worse in the villages around Kathmandu, he knew he needed to do his bit to help the people in these unfortunate places. Thus was born Village Nepal--an organisation that with the aid of Polish Humanitarian Action and various other NGOs, plunged into distributing relief materials in Sindhupalchok (one of the worst-hit areas by the earthquakes). After working through the relief phase, Sherpa wanted to focus on providing the sort of help that would have significantóand long-term--impacts. That's why he homed in on building schools in areas worst hit by the earthquakes. But then arose the question of where to build the schools, as there were many such earthquake-hit villages in need of aid and rehabilitation help. On the suggestion of experts from Village Nepal's needs-assessment team (who had visited Okhaldhunga, Sindhupalchok and Dhading), the organisation decided to build schools in Gumdi, Dhading, because their findings showed that the VDC had been affected the most severely among the locations studied. Once theyíd decided on Gumdi, they again conducted a needs assessment of the 12 schools in Gumdi, and came up with a list of six of the worst-hit schools that they would rebuild. Village Nepal wanted to build schools in a manner that would help achieve two aims at once: they wanted to make the most judicious use of their funds, and also make use of local manpower in their construction. They figured that having locals help build the schools would engender in them a sense of ownership of the project, while providing them employment too. 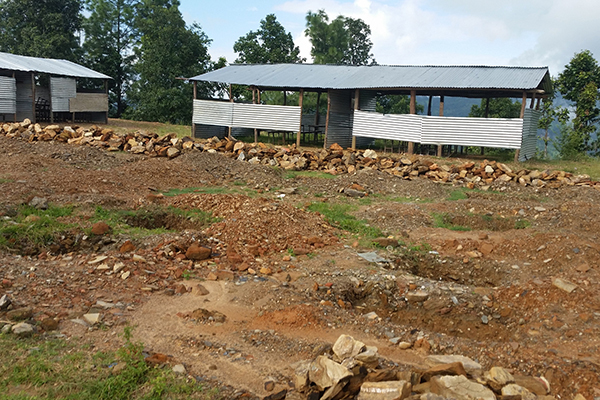 To further help the local economy, Village Nepal used locally made bricks for constructing one of the six schools that they built in Gumdi. To further reduce costs, Village Nepal opened a regional office in Dhading itself, from where they organised and managed the overall operation. When they started work on the schools, the students were studying in temporary learning centres, so they decided to build all six schools at the same timeóso as to reduce overall construction time. This decision too was born of the need to be cost-efficient, as all the construction materials could be transported at the same time, and surplus materials in one site could be easily ferried to a site that needed them. The Salmetar Primary School did not have access to a road. So Sherpa and his team employed bulldozers to create a road leading up to the school. Most of the previous buildings in all six schools were flimsier, mostly made of unreinforced walls. They were not as solid as the ones that Village Nepal has constructed as replacements. 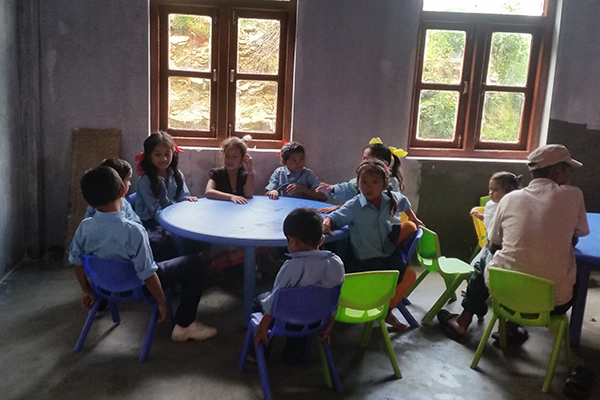 The current school buildings, however, are earthquake-resistant (their designs were approved by the Nepal Government), are disable-friendly and have a number of new amenities like libraries and sanitary toilets. After the schools were constructed, Sherpa wanted to focus on helping the local economy. 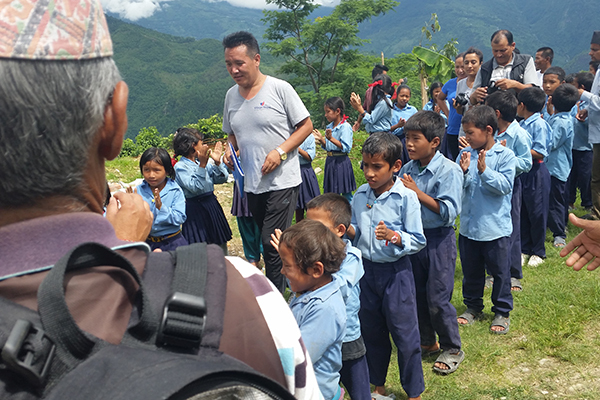 "Just constructing the schools was not enough for us," says Sherpa. "We wanted to create a long-term impact on the people there, so we came up with two programmes: a teacher training and a livelihoods programme." With the help of the District Education Office Dhading, Village Nepal conducted a three-day teacher training course for all the teachers of Gumdi Village. The teachers were trained by an expert who helped them come up with child-friendly teaching-learning activities, honed their classroom-management skills, taught them child-safety and protection protocols and improved their curriculum-development skills, to name a few. As for the livelihoods training portion, Village Nepal provided each household with a goat and 10 chicks, and trained the villagers on how to raise the livestock, and thus have an added income stream. until they had finished constructing all six schools. Before the earthquakes struck, Sherpa was an entrepreneur who thought his calling in life was to set up successful businesses. But after having invested so much time on relief and reconstruction projects, he realised that he wanted to focus on projects that helped others. Indeed, he wants Village Nepal to get even more engaged with villagers. 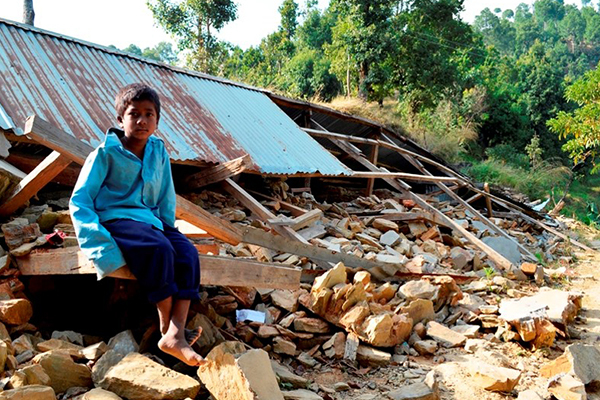 Today, Sherpa is working on developing an integrated programme for children of criminals and earthquake victims. Because these children are vulnerable and prone to bad influences, he plans to build a residential school and create a safe environment for them to learn and grow. Provide expanded learning opportunities: Montessori block, early childhood care and development block, and basic education block and secondary education block. Learning centre: Well-equipped school library, book corner in each class, and ICT labs for both teachers and students. Health services: Regular health check-up programmes for students and teachers, and referral services for the differently-abled. Guidance and counselling services: Nutrition counselling, counselling for girls during their menstruation period, and academic counselling and parental counselling. Family support and engagement: Basic information for parents, literacy programme for illiterate parents, life skills based income-generating skills training, and seed money for income-generation activities to boost the parentsí income. Overall school-infrastructure: School buildings, hostels for girls and boys, school libraries, separate toilets for girls and boys, ICT labs for teachers and students, health care centre, and counselling room and so on. Ongoing professional support: Provide help with curriculum and pedagogy, use of ICT in pedagogical activities, and professional support for the teachers to help them implement child-friendly teaching-learning activities. Midday meal programme: Children will be provided with midday meals at the school. Income-generation activities: Provide opportunities for children and their parents to design and implement income-generation activities. As part of their co-curricular activities, children engage in income-generation activities inside the school complex and their parents will also be involved.